I'm also immensely appreciating this seroes. It's made me aware of a few bands that I didn't know existed, and reminded me how great a lot of the others were. For those not familiar, the Yugo prog music scene was to Eastern Europe as Italy was to Western Europe(that is to say, the best!). I expect to see Tako, Ipe i Laza, Soncna Pot, Miha Kralj and others soon. And regardless of what Richard says, that first Gordi LP, Covek, is a killer! Love your thread! My wife is from Istria (Croatia) and I am always looking for local music..She is in her early 50's and doesn't recall any of these bands, but I am certainly digging them..Thanks & Hvala lijepa !!!! Interesting, but no mention of Ljubljana -I had a short holiday there the Christmas before last and was very impressed with the place. Very relaxed and civilised. And the Art Nouveau architecture was fabulous. Dah ("Breath") were formed in Belgrade, in 1972. The members were Zlatko Manojlović (guitar), Branko Marušić Čutura (vocal, guitar), Branko Gluščević (bass) and Radomir Dubičanin (drums). Dah were searching for inspiration in the mythical and literary themes. They appeared at Ljubljana's Boom Festival 1973. After debut single released, Čutura left the band, so Dah continued as a trio with Manojlović as a vocalist. Dah released debut album entitled Veliki cirkus ("Big Cirkus") in 1974. The band enjoyed some kind of international success with their hit single Shoshana during their sojourn in Belgium, in 1975. 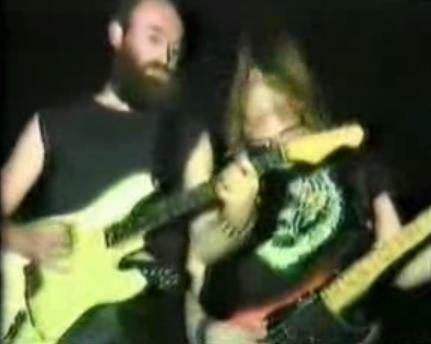 In Belgium, the band used the name Land and featured some new members: Tommy Schpalteholtz and Villy Pulz. The singl Shoshana was released on Polydor, and it raised to No. 1 at the Radio Morocco's tip list. In Luxembourg, the band played some sessions with Dutch prog band Focus. Upon return to Yugoslavia in 1976, Dah released second full-lenght album Povratak ("Return"). Dah disbanded soon after Povratak was released. Zlatko Manojlović continued as a solo artist, and with the band Gordi in 1977. Count me among the admirers of Yugo-prog, but the area where I think that Yugoslavian artists made a unique impact at an international level is Yugo-wave. The quality of post-punk Yugoslavia is unsurpassed in Europe (even by neu deutsche welle or french cold wave standards). Aerodrom ("Airport") were Zagreb's band formed by Jurica Padjen (ex-Hobo). After their thriving concert at Boom Festival in Novi Sad, Aerodrom released symphonic rock debut album Kad misli mi vrludaju, ("When My Thoughts Run Free"), in 1979; line-up was Jurica Pađen (guitar, vocals), Zlatan Živković (vocals, percussions), Remo Krstanović (bass), Mladen Krajnik (keyboards) and Paolo Sfeci (drums). However, at the second album onwards, Aerodrom changed the genre into New Wave. They disbanded in 1987 after their fifth album. Yugo-prog was the basis for Yugoslav post-punk actually, because almost all of Yugoslav post-punk musicians had previously played in the prog bands - regardless of whether they released the albums or not. Gordi ("The Proud Ones") were Belgrade's band, founded in 1978 by guitarist, singer and composer Zlatko Manojlović (ex-Dah), accompanied Zlatko's brother Goran Manojlović (ex-Dah, keyboards), Stevan Milutinović (ex-Dogovor iz 1804., drums) and Dragan Janković (bass). In 1978, the band released first of their two prog albums; other albums are Heavy Metal. The debut album entitled Čovek ("A Man") is a very good and indeed worthy album for Yugo-prog scene. Last edited by Svetonio; 03-28-2016 at 02:21 PM. 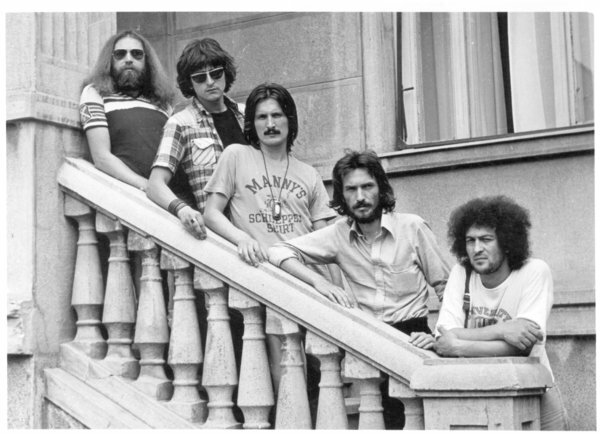 Sončna pot ( "The Sunny Street"), formed in Ljubljana, were one of Yugoslavian jazz-rock acts. This short-lived, guitar-less trio consisting of Lado Jakša (saxophone, clarinet, mellotron, organ, piano), Ratko Divjak (drums) and Jordan Gančev (bass, electric piano). They released only one s/t album in 1979 (the guest on the album was Uroš Šećerov on percussions). Last edited by Svetonio; 03-29-2016 at 07:20 AM. Tako ("Thus") were typical Yugo-prog band as they mixed symphonic rock with jazz-rock & space-rock. Tako was formed in Belgrade, in 1974, by Dušan Ćućuz; Tako quickly become a concert attraction in Yugoslavia. 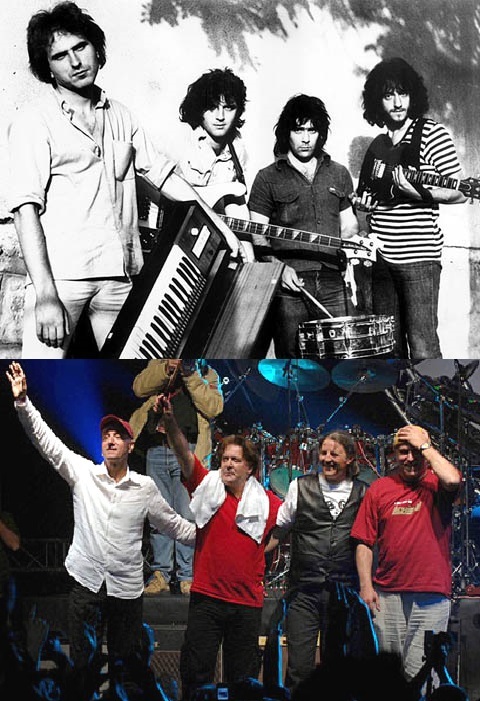 The line-up who released Tako's two albums were Dušan Ćućuz (bass), Miroslav Dukić (guitar, vocals), Slobodan Felekatović (drums) and Djordje Ilijin (keyboards, flute, harp). Tako disbanded in 1981. Tako's keyboardist and flutist Djordje Ilijin released an interesting solo album entitled Zabranjeno prisluškivanje! ("Eavesdropping Forbidden!") (1983) after Tako was disbanded. Last edited by Svetonio; 03-31-2016 at 03:07 AM. I really wish there'd been CD versions of the Soncna Pot and Den Za Den albums, plus the second Time release. There's a fairly good vinyl reissue of the Hobo record out there these days (as well as the Izvir, Kornelyans and once again both Tako), and even the obscure Trio Dag album has had a recent CD reissue. I'll be scouring this thread for some new finds, thanx! Smak ("Endtime") is (imo) the best Yugo-prog band. They released eight full-lenght studio albums and three EPs; two albums were re-recorded in English. They were founded in 1973, in Kragujevac, by guitarist and composer Radomir Mihajlović nicknamed Točak ("The Wheel"). Other members were Slobodan "Kepa" Stojanović (drums), Zoran Milanović (bass), Boris Arandjelović (vocals) and Lazar "Laza" Ristovski (keyboards); that's the line-up who relased their first s/t album which featured magnificent side-long instrumental composition Put od balona ("A Path That Is Made With Baloons") recorded in one-take. 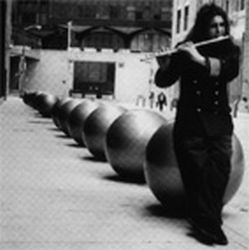 At the second album Crna dama ("Black Lady"), recorded in Morgan Studios, London, in 1977 (it was the same studio where Jethro Tull recorded Songs from the Wood), Laza Ristovski left the band to joined Bijelo Dugme, and Smak's new keyboardist become classical music graduated keyboardist Miki Petkovski, and that was Smak's best line-up. On the third album Stranice našeg vremena ("The Pages of Our Time") (1978) Miki Petkovski was replaced - after one of many fights in the band - with keyboardist Tibor Levay. After the albums Rock Cirkus and Zašto ne volim sneg ("Why I Don't Like Snow"), Smak officially disbanded, though they continued to play gigs from time to time and to record new albums. Smak's reputation as the greatest (prog) concert attraction in Yugoslavia began with their gig as an opening act for Deep Purple in Belgrade 1975; and although Smak then was virtually unknow band with just one single released, then Deep Purple's manager was asking the boys from Smak to join Deep Purple at their world tour as an opening act, but due to the fact that Točak was terribly suffering of stage fright at whole of his career, he got scared of so much gigs in Japan and so on, and the band sadly rejected that fantastic opportunity. Their style was pretty hybrid, but always top of the notch. Last edited by Svetonio; 04-01-2016 at 08:47 AM. Last edited by Svetonio; 04-01-2016 at 12:26 PM. Ex-Smak and Leb i Sol keys player Miki Petkovski released an album in 1979 where played both Smak and Leb i Sol members and which is really excellent. Last edited by Svetonio; 04-01-2016 at 02:53 AM. Lazar "Laza" Ristovski (1956 -2007) was keys player and composer; in 70s, he played keys in Smak and Bijelo Dugme, and started his solo career as a duo with ex-Bijelo Dugme drummer Goran "Ipe" Ivandic; the duo Laza i Ipe released a symphonic rock album Stižemo ("Arrive") in 1978. In early 80s, Ristovski released two electronic music solo albums of Merge (1982) and 2/3 (1983) which are worthy for Yugo-prog. He also composed a lot of stuff for the movies, TV and theatre. Last edited by Svetonio; 04-01-2016 at 08:53 AM. In late 70s, Leb i Sol ("Bread and Salt") was great progressive fusion band and also great concert attraction in Yugoslavia. 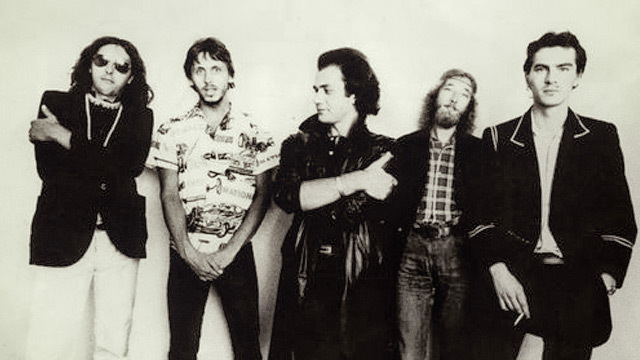 They were formed in 1976, in Skopje; that original line-up were Vlatko Stefanovski (guitar and vocals), Nikola Dimuševski (keys), Bodan Arsovski (bass) and Dimitrije Čućurovski (drums). In 1977, Garabet Tavitijan replaced Čućurovski on drums and this line-up would last until 1980, making the first three albums that are world class of progressive fusion and they sound fresh even today. Dimuševski left in 1980, to be replaced for a short time by Miki Petkovski (ex-Smak), but he left Leb i Sol promptly after that. Vlatko Stefanovski decided to continue as a trio - without keyboards. Sadly, the fourth album introduced a change of music direction from progressive fusion into mainstream rock with some world fusion elements here and there and that change making more accessible to mainstream pop/rock audience. Tavitijan left in summer 1982 and his replacement was Dragoljub Djuričić (ex-Yu-grupa) An interesting detail that ther 8th album Tangenta was produced by Kevin Ayers. Leb i Sol's farewell concert was in Thessalonica, Greece, in 1995, and Leb i Sol disbanded. Stefanovski founded his own label Third Ear Music in 1990 and continued with successful solo career as world music star. Though, Vlatko Stefanovski reunited Leb i Sol - with keyboard player - for a serie of gigs in 00s. Ručni rad ("Handwork"), full-album, 1979. Last edited by Svetonio; 04-01-2016 at 12:35 PM. Last edited by Svetonio; 04-01-2016 at 12:19 PM. This second SMAK album had also a greek release on the Music Box label as "Black Lady". In 1979.